Photo of 2019 Transit Connect courtesy of Ford. 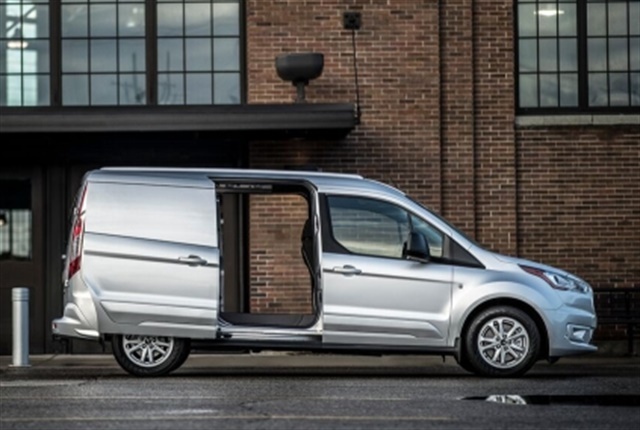 Ford's 2019 Transit Connect compact cargo van is adding a diesel engine option, fleet model that can be easily converted to run on gaseous fuel, and array of driver-assisting features to reduce accidents for commercial users, Ford announced at the Work Truck Show in Indianapolis. The upgraded model will offer three engines capable of running on five different fuels to give commercial and government fleets many choices to find the right engine for their needs. The 2019 Transit Connect will offer a standard 2.0L inline four-cylinder, 1.5L EcoBlue diesel, and 2.5L inline four-cylinder exclusively for fleets. The base engine, which includes auto start-stop technology, delivers power through an eight-speed automatic transmission to achieve low-rpm cruising on the highway and responsive performance. The E85-compatible engine comes with a standard heavy-duty battery and available heavy-duty alternator to supply power for upfit applications. The EcoBlue diesel should achieve an EPA-estimated 30 mpg on the highway, according to Ford. The engine combines the latest in fuel injection, turbocharging, and emissions-control technologies to reduce fuel consumption. The engine is also fitted with the 8-speed transmission. The exclusive fleet model pairs its engine with a 6-speed automatic transmission. Ford is offering a factory gaseous fuel package that allows fleets to more easily convert it to run on compressed natural gas (CNG) or propane autogas. The base model and diesel engine come with EcoMode and EcoCoach, which monitor fuel economy and encourage fuel-efficient driving behaviors. Photo of 2019 Transit Connect's interior courtesy of Ford. Transit Connect will also boost driver-assisting technologies and make more of these technologies standard equipment, including automatic emergency braking. The cargo van also offers standard pre-collision assist with pedestrian detection, side wind stabilization, and a rear-view camera. Available technologies include a blind spot information system with cross-traffic alert, a lane keeping system, and adaptive cruise control. Transit Connect now also includes standard embedded 4G LTE modem that provides Wi-Fi for up to 10 devices, while an available 6.5-inch floating touch screen running SYNC 3 helps drivers keep their eyes on the road as they field customer calls and text messages hands-free or navigate to job sites. Available wireless phone charging is a segment-first feature, according to the automaker, which keeps compatible mobile devices topped off and ready for service. FordPass helps monitor small fleets, including driver location, fuel level, tire pressure and more. Ford’s MyKey programmable ignition key remains standard for Transit Connect XLT enabling owners and fleet administrators to preset warnings and limits for vehicle speed while restricting the entertainment system’s audio to 45% of maximum volume. Transit Connect’s interior has also been rethought. Redesigned front seats with new seat foam offer enhanced comfort over the previous model. With city-friendly dual sliding side doors, a wide and flat load floor finished in durable vinyl, near-vertical walls and integrated tie-downs, the Transit Connect boasts flexible and generous cargo-carrying and towing capability. Loading a 48-inch pallet via forklift is easy with 180-degree swing-out rear cargo doors that can be locked in the open position. With a 38.3-foot curb-to-curb turning diameter, short-wheelbase Transit Connect can maneuver and park on tight city streets. Transit Connect also provides a towing capability of 2,000 pounds when paired with the available tow package. It’s engineered for maximum durability and service intervals to mitigate downtime. In addition, the new Transit Connect Cargo Van is customizable, with substantial support from aftermarket upfitters and suppliers for interior cargo management solutions, ladders, and roof racks. Businesses ranging from mobile dog grooming to pipefitting will benefit from the ease in upfits.